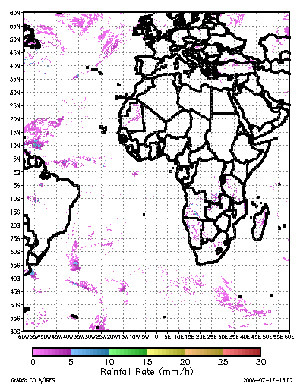 Additional of GOES visible data for improved daytime rain / no rain discrimination. For additional details, please refer to the slides from a presentation at the 23rd American Meteorological Society Conference on Hydrology. A conference paper can be found here. The next-generation of NOAA's Geostationary Operational Environmental Satellites (GOES) is scheduled for launch in early 2015, and it will feature advanced sensors that will be highly useful for remote sensing of precipitation. These include the Advanced Baseline Imager (ABI), which will feature more spectral bands, finer spatial resolution, and more rapid scanning than the current-generation Imager, and the GOES Lightning Mapper (GLM) which will provide the first-ever operational monitoring of lightning from geostationary orbit. For the first two algorithms, the Hydrology AT selected and evaluated several candidate algorithms using METEOSAT Spinning Enhanced Visible Infra-Red Imager (SEVIRI) data as a proxy for ABI. The results of this testing were that the Self-Calibrating Multivariate Preciptation Retrieval (SCaMPR) algorithm was selected for the rainfall rate retrieval, and the K-Means technique developed at the NOAA / OAR / National Severe Storms Laboratory was selected for the rainfall nowcasting. 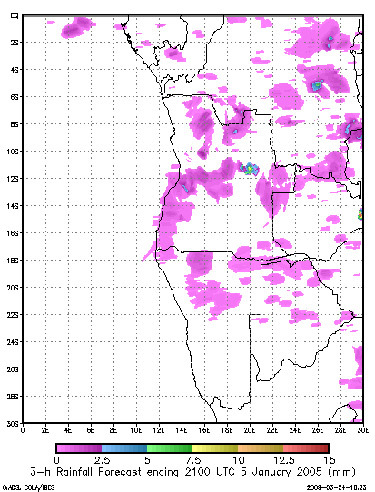 Since there are no legacy satellite-based probability of rainfall algorithms, the algorithm has been developed "from scratch" using statistical matches between intermediate rainfall forecasts from the Rainfall Potential algorithm and observed rainfall. The source codes for all three algorithms are in various stages of implementation into a demonstration operational framework at this time.